DIR's "Best Practices in Supplier Diversity Strategies and Initiatives"
We put together a quick video recapping DIR's 2014 and 2015 "Best Practices..." seminars so you could get a sneak peek at the terrific networking, professional learning and dynamic contributions both the speakers and the attendees offer. Take a look! Why register as a diverse supplier? TLC Springwater's story helps answer that question . . .
"Why should I register?" is a question we are asked every day here at DIR. The bottom line is that it makes good economic sense and it will, eventually, save you time as you're out prospecting for new clients. When you register with DIR as a diverse-owned business, your information becomes part of a database that is accessed and searched daily by thousands of buyers at major corporations. Take a look at this short video about how registration helped TLC Springwater in Cleveland, OH grow their business. Keep in mind that the portal of information DIR manages is only one of a few that major corporations around the world use for sourcing, searching and managing information that they'll eventually need for reporting either inside or outside their organization. The information that you provide is crucial to their future contracting opportunities and that's just one of the reasons they rely on DIR for information validation and verification. In a nutshell, suppliers provide the information, DIR makes sure it stays current and valid. DIR's client list continues to change, of course, and there are other supplier portals 'out there' that are used as well so don't be surprised if your business grows to the point of being asked to create profiles in numerous databases. Take your time, keep an 'excel' file or other cheat sheet with the often-requested information, and be sure to use a contact email that is not unique to just one person in case there are personnel changes. When you're ready, you can register here. Thank you! DIR helps corporate supplier diversity programs thrive. DIR delivers tool for supplier diversity initiative success. Whether a corporation's need is launching a new supplier diversity initiative or further developing an existing program, DIR has the proven expertise to help SBLOs, supplier diversity and procurement professionals plan, implement and manage a successful supplier diversity program. This video story is about a corporate supplier diversity professional who began to use DIR's managed services including data management, certification validation and sourcing lists. It helps illustrate how DIR can function as an extension of an-house staff (or lack thereof!). As always, DIR staff is available to answer questions anytime ... please reach out to see how DIR can help you drive supplier diversity success! 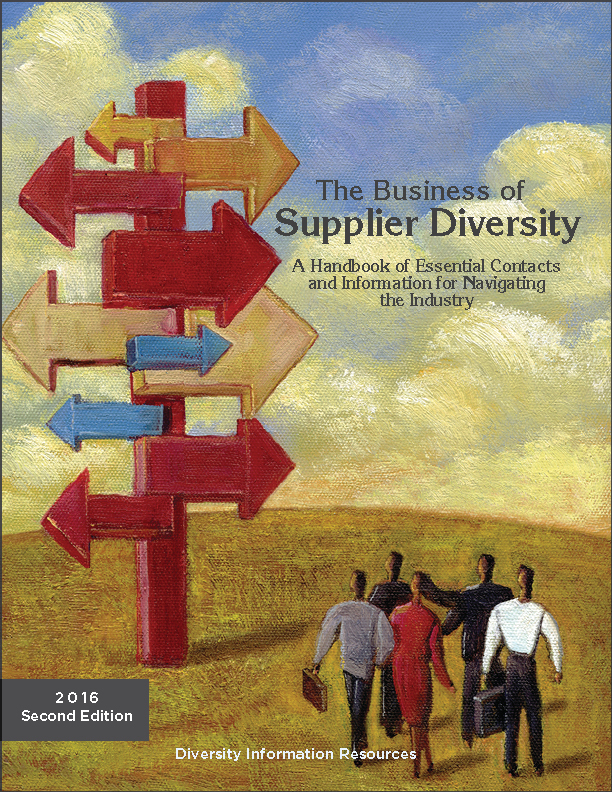 Looking for help navigating the supplier diversity industry? DIR's resources can help! 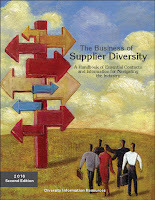 The Business of Supplier Diversity: A Handbook of Essential Contacts and Information for Navigating the Industry ($135.00) combines who-to-call with where-to-look and provides a road map to the supplier diversity industry. Diverse-owned suppliers and supplier diversity professionals use the helpful listings for reference, marketing and planning purposes. It offers a detailed contact list of over 900 supplier diversity and procurement contacts at major corporations, government agencies, large non-profit organizations, and educational institutions and supplier diversity industry information regarding certification, legislation and additional resources essential to small- and diverse-owned businesses. This book is available in a hot-linked PDF download, too. The industry contacts only can be purchased as DIR's "Purchasing People in Major Corporations Online". The 2016 National Minority and Women-Owned Business Directory ($175.00) is the go-to guide for finding certified MBE/WBEs in the USA. 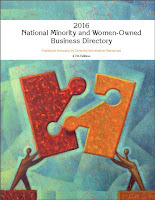 This unique resource, published annually, lists over 7,500 nationally certified Minority and Women-Owned Businesses. Data is organized by Category and State; helpful keyword index included. Identifies: Company Name, Address, Contact, Capabilities, Website, Email, Ownership Type, Certifications, Revenues, Number of Employees, and more. Visit us online to see excerpts and learn more. Together, we can "Drive Supplier Diversity Success".